It’s time to have a closer look at the cultures of the ‘maker revolution’. The tech world is getting increasingly excited about the opportunities presented by 3D printing, open source hardware and the new markets for DIY that they produce. But somewhat unsurprisingly, there has been little attention paid to the cultural aspects of these practices. So far, writers have assumed that ‘makers’ are pretty similar to ‘hackers’ (ie, mostly men, mostly young, etc), and what they are up to is much the same as in the software world. In fact, women play a much larger role in open hardware and ‘making’ culture than in open source software culture, although you wouldn’t necessarily know it from some of the recent writing on the subject. Is ‘Maker Culture’ just about printing your own lego? Wired Magazine’s Chris Anderson has published a new book (Makers: The New Industrial Revolution) in which he enthuses about the way that 3D printing can inspire individuals to make things that they can then sell to others in a a number of ‘long-tail markets’. He evokes a world where people manufacture their own Lego bricks that can then be endlessly recombined to build new things. (Sadly, this book is nowhere near as good as the novel by Cory Doctorow, also called Makers, which uses the same ideas, but imagines that they combine to make a new economic system, which is then challenged by the powers that be. It’s great – read it – you can get it here for free). In a review ofAnderson’s book, the Guardian’s Simon Poole points out that “in Anderson’s brave new world, everyone is a creative-geek tinkerer but no one does the boring stuff.” This boring stuff, the stuff that can’t be outsourced, includes making pizzas and running dry cleaning shops. So there is Makeable stuff (Lego?) and Non-makeable stuff (bread? pizza? laundry?). One is hip, and the other is not, and it is interesting to see that the non-hip stuff is not only non outsourcable, but the stuff that we used to think of as women’s/domestic work, not worth counting or paying for. I think there is a better story to tell about ‘making’ than this one, and that better story acknowledges the various ways that making is gendered and cultured. This seems obvious enough, but actually doesn’t come through in many of the discussions of open movements. We need to acknowledge this as a research community – first, so we can acknowledge the innovations of cultures past, some of which are obscured because of the inattention to women’s history. And second, so we can avoid essentializing gender and culture when we make recommendations for how to open knowledge or create knowledge sharing processes. To address this cultural gap, I will start by talking about craft – the making of lots of things (beautiful, bespoke things) for individual home use. My grandmother studied home economics in the 1930s. Then she raised five children and decided to go back to school. In her 50s and 60s, she was an art teacher and now, in her 80s she is a well-respected spinner, weaver and fibre artist. 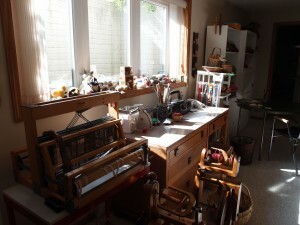 This is a picture of her studio. She made all her own clothes and her kids’ clothes for many decades. My mother also made many of her own clothes, and our family holidays included learning crafts like knitting, sewing, clothes dying and paper making. I grew up in a world of craft, and a world of specialized, ‘made’ objects. Until the development of Etsy, the only way to buy someone else’s craft would be to wait for the annual craft sale. For women like my grandmother, craft was a necessity, but also a way into a sustaining creative practice. I have not followed in this family tradition (once being told I was ‘craft impaired’ after failing to complete another project), since I always preferred either reading or messing with computers. When I started working on tech cultures I got really excited about the idea of hacking, and dove into reading about the guys at MIT who snuck into the lab at night, built train sets, and set about making the frameworks for free software. I got even more excited when I saw the ideas of free software (ideas about the responsibility to keep ideas and materials that you received from a commons available for anyone else). Open source and free software have had a big impact on DIY cultures in software, and in the computer-based world of hacking. These ideas have also started to flow outwards to influence the idea of making hardware open-source – as I wrote about in this article. What I see happening now is a collision of the two worlds: the Making culture has a cultural history from the MIT hackers but it also has a strong influence from traditional crafting cultures. Both of these histories are being transformed by their combination. Traditionally, home economics, crafts and arts were invisibly the work of women. The rise of ‘home economics’ as a disipline suggested that these activities could be studied and made scientific. Women’s creative work was valuable within the domestic sphere and as a support and comeplement to other work taking place outside. In the decades that followed, second wave feminism invited women to embrace other kinds of work outside the home, and increased prosperity reduced the economic necessity for home canning, rug-making, knitting and sewing. Now, craft and DIY reappear as political acts, reclaiming the personal and communal in a neoliberal capitalist system that has separated effort, affect and creativity from production. This communal aspect has historical roots in activities such as quilting bees and knitting groups, but has flourished online too, through community sites like Ravelry.com and the hundreds of recipe sharing sites that proliferate on the internet. Craft slides in to art, and craft appears as well in a reinvigorated space for DIY practice that also includes new forms of craft commerce, like Etsy.com and social media marketing for individual crafters. Craft is commerce, and craft is collective. Millions of people learn once again that everyday making has a beauty to it, and that everyday making is something done together, as a community and culture. Open Hardware carries this forward: designing and making electronic kits positions entrepreneurs at the nexus of craft and hacking – and many of these entrepreneurs are women. Limor Fried’s Adafruit Industries makes and sells a number of electronics kits including Arduino boards and Raspberry Pi min-computers. Ayah Bdier’s littleBits make up a library of electronic components that snap together with magnets (the photo above is of a prototype I saw at the 2011 Open Hardware Summit – the finished ones are MUCH COOLER). Leah Buechley’s LilyPad Arduino is a set of flexible electronics that can be sewn into clothing – a particularly satisfying mixture of the hard and soft. In addition to entrepreneurs there are also artists who push on the space between electronics, art, and craft creation – projects like Rachel Lyra Hodspar’s Medium Reality menswear (and pants interface) and the tinkerers/artists/media-makers who are part of the Constant Association for Art and Media. Finally, Catarina Mota keeps up research on new materials and making through the Open Materials Project. What’s interesting about these projects is that they are electronics and ‘making’ projects but they are also linked into cultures and practices of art and craft – to experimentation and creation. To sum up, there are a few aspects to the cultures of open hardware that I think are different than open software, and that I think are worth considering (and celebrating) as we start thinking about the politics implicit in Anderson’s argument about the economic and social benefits of ‘making’. 1. open hardware projects cut across and connect with other forms of DIY, taking up this politicized and gendered dialectic in a productive and interesting way. 2. Many open hardware entrepreneurs are women. My observation of these projects is that they are pragmatic, creative, and fill market niches, but that compared with open software projects they are less concerned with the debates about licensing, division of labour, etc. 3. 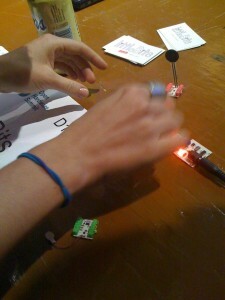 There is also a cultural link connecting open hardware with new media art and experimental art forms. Hardware designers and entrepreneurs aren’t just coming out of computer science departments, they are coming out of media and design departments and through a whole range of other professional and creative paths. While the art world has its own gender issues, this variety of pathways may be less constraining that the expectation that tech entrepreneurs come only from computer science backgrounds. I’ve been watching and thinking as the world of ‘making’ has moved from one in which some making work was innovative and high tech and some making work was pretty well invisible. The growth of open hardware as a place of creative opportunity and entrepreneurial opportunity is also connected to its position in a longer history of making and doing in which women have also participated. We now have some interesting opportunities to look at the current developments and the historical context, and celebrate the progress we are making. This entry was posted in Uncategorized on December 19, 2012 by Alison. I like how you’ve normalized DIY/making within an overall very small market niche. I mention markets here because it seems like there’s a recurring theme of economic incentives throughout your posting. Moreover, the conclusion sounds like there’s an economic trajectory to which makers/DIY folk are either on or to which they are adhering. However, I’d like to ask, do you think that this is necessarily the case? Open hardware is not cheaper than mass producing a board or complete hardware package. Raspberry Pi pricing is a perfect example. In the conclusion you note “We now have some interesting opportunities to look at the current developments and the historical context, and celebrate the progress we are making.” To which I must ask, what progress? In what realm? What is the goal here, and for whom is this goal relevant? I’d say to each that open hardware can be either, but is not necessarily always depending on the intent of the actor involved. If someone else chooses to see a project through either of those lenses then so be it, but it seems a little proscriptive to have to pull a Jamesonian everything is an “implicitly or explicitly political stance on the nature of multinational capitalism today” move when it really can just be about the fun of making something. The same goes for gender. I appreciate the historical positioning, and there is indeed value in drawing attention to the issue, but at the same time, people make stuff, that’s it.. If someone chooses to make something with an orientation or awareness of their gender that’s fine, but why is it relevant if they do not care? 2 is a corollary of 1b – it’s almost like saying the sky is blue. Is your observation of women and their specific projects being less concerned with licensing, or of open hardware projects in general? I would be very much more surprised if there were no women involved. Also note that in terms of licensing, there is an entire set of legal systems in place that make hardware much less troublesome than software when it comes to intellectual property. One cannot copyright or copyleft hardware designs, the entire body of law that is so relevant to software does not apply to hardware, so the barrier to entry there for anyone, male or female is reduced. Moreover, because patent regimes are growing so problematic, I’m guessing for a project that it is easy to just call something open and it will be unless someone spends the time filing and acquiring patents. Just a few thoughts, thanks for the article. Thanks for the comment. It’s always nice to get replies. I chose to frame the post using the idea of economic value because that is how much of the other literature in this area is framed. As you know however, the very fact that making is a cultural act meas that economics alone do not explain why and how people participate.That’s why I wanted to look at different cultural histories and how they connected with this supposed economic imperative. So the ‘progess’ I implied is in understanding HOW and WHY and WHAT PURPOSE people make stuff. Because of course people make stuff. That’s how we express ourselves. From this perspective, I take issue slightly with your claim that it’s not important to look at gender. Gender is a cultural construct. Since we all operate from within this construct all the time, it is relevant how we deal with that construct, or how it is applied to us. So while the entrepreneurs and artists I listed in the post might not consider that their gender identity (as they understand it) is significant in their practice, society as a whole might. And that makes it worth considering from a cultural analysis point of view. I am looking deeply into licenses in another strand of my research, so I won’t touch on your final point here, except to note that – oh yes, licensing makes so much difference, and the bits/atoms distinctions are really significant. Great to get some ideas exchanged here – these posts are part of a bigger project on ‘openness’ that’s still developing, so comments always helpful.